After the recent launch of the Motorola Moto 360 (2nd Gen) in India, ASUS has launched its second Android Wear-based smartwatch in India. The ASUS ZenWatch 2, which was unveiled during Computex 2015 in June, will be available exclusively through Flipkart with a starting price of Rs. 11,999. The smaller screen variant is priced at Rs. 11,999, while the larger screen variants are priced at Rs. 14,999. 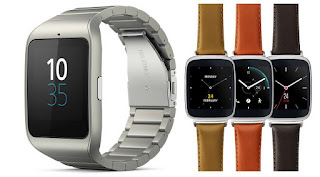 The ZenWatch 3 is a second-generation Android Wear-based smartwatch, and comes in three colours; Blue, Khaki, and Taupe. The Blue and Taupe variants have 1.63-inch AMOLED displays with 320 x 320 pixels resolution, while the Taupe colour variant sports a 1.45-inch display (280 x 280 pixels), and is suited for women. There’s a 300 mAh battery in the 1.45-inch screen variant, while the 1.63-inch variants have a 400 mAh battery. It features a Qualcomm Snapdragon 400 processor, 512MB RAM, 4GB internal storage, and runs Android Wear 5.1 Lollipop. As most smartwatches these days, it is IP67 water and dust resistant, and feature Bluetooth and Wi-Fi connectivity. The ASUS ZenWatch 3 competes with the Motorola Moto 360 (2nd Gen) and the LG Watch Urbane, both of which are comparatively priced quite high, but it misses out on a heart rate monitor. I really like your new site…!!!! !